Horsham Church of Christ has made a significant leap of faith into its brand new church. Horsham, in Western Victoria, isn’t a large town but an important rural centre, and the church has an active and loyal membership that faithfully saw out this significant project over many years. The church leadership began talking to Mozaix some eight years ago. At that crucial stage Mozaix director, Paul Tucker, had one clear imperative to impart: make sure the AV integrator and acoustic consultant are at the table during those planning meetings. Mozaix didn’t necessarily set out to be Melbourne’s go-to house of worship AV specialist — but word spread that Paul Tucker and his team genuinely understood the, sometime, unusual and competing demands of modern church installations. Having a seat at the planning table ensured the building design worked with the acoustic treatment and the essential AV infrastructure, such as the lighting bars and PA rigging. The right performance level can only be decided on through proper consultation. Again, here’s where Mozaix has a proven track record of understanding the market and understanding that churches often struggle to frame their requirements without being walked through the options. The main auditorium sits 350 people on the floor with a mezzanine level for an extra 200. The PA design required a lot of vertical coverage. Paul and his team worked on point source loudspeaker designs but struggled to bring something to the table that wouldn’t require a delay system for the balcony. 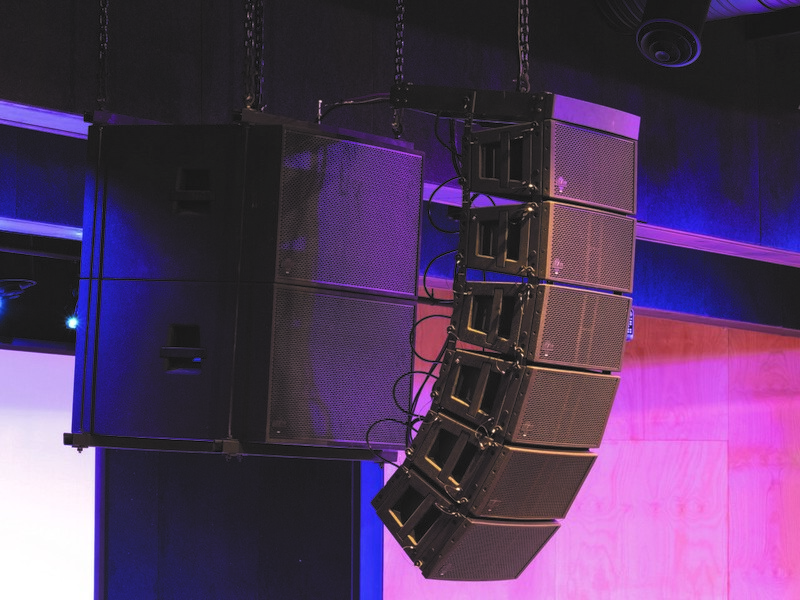 After extensive consultation with a number of vendors, EAW and its Australian distributor PAVT pitched a system design based on its new Radius line array that was compellingly priced and, according to the modelling, would be ideal for the unusual dimensions of the room. With six elements of Radius aside and two flown 18-inch subs aside, most people’s first impression is: ‘that’s a lot of PA’. Paul Tucker: “With six elements aside, 90 percent of that is about even coverage. The Radius PA may be more than the church will ever need for most Sundays but, in that, there’s enough headroom to accommodate touring acts and special events. Radius is an unusual beast. It’s not a constant curvature array. With its two eight-inch drivers and two HF units, it’s a true line array with adjustable inter-cabinet splay angles, but is priced well enough to take some market share from the constant curvature systems so popular in houses of worship. Radius is an active PA that natively accepts Dante digital audio and can be configured via a Radius iOS app. Some six EAW VFR69i six-inch passive loudspeakers provide infill from the lip of the stage and help to bring the sonic image down. The new church with its full-spec kitchen and huge foyer (not to mention the best AV spec for miles) is quite a desirable addition to Horsham’s venue options. For the church, that was always the plan — the new facilities were always about connecting with the broader community. Already the calendar is starting to fill up. Schools are booking the auditorium for presentation nights. Funeral directors are calling the church to accommodate larger funerals. As you might expect, Horsham Church of Christ doesn’t have a liquor license and nor would it be courting secular rock gigs and the like. But the new facilities, and the state-of-the-art audiovisual systems that go with it, has broadened the church’s reach, influence and income streams. A step of faith? Sure. An inspirational one? Absolutely.